I was probably one of the last people to see this one. It wasn’t for lack of trying, but things kept coming up to prevent me from getting to the theatre. I finally saw it on Friday and there were only about eight of us in the room, so I figure that the rest of the population has seen it. I have to confess that I was a bit disappointed in it. The first thing that annoyed me was the lighting. Yes, I get that it was supposed to be an Armageddon type battle but the cinematography was terrible. There was a lot of this film that I couldn’t see. I had to peer at the screen to determine what action was occurring. In the scene with the horde on the hill, the hill was black, the death eaters wore black, the sky was black… See where I’m going with this? It was quite hard to discern what was what. Very annoying and it took me right out of the story. 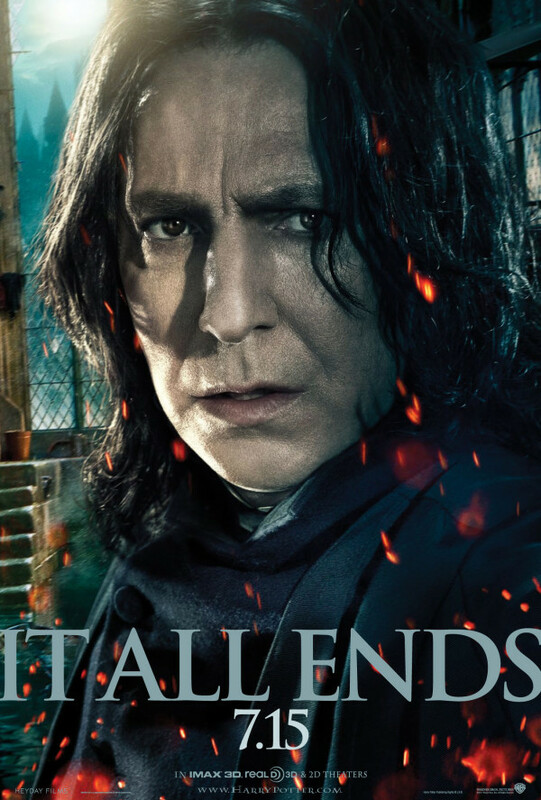 As to the flash back scene with Snape, I was highly disappointed with that. As anyone who has read this blog knows, Alan Rickman is my absolute favorite actor and I’ve always felt like he was underutilized in this series of films. Again, we have the same issue. This scene was beautifully written in the book and the film version made short shrift of it and didn’t engage my emotions as the written word did. It could have been done so much better but I think the film maker wanted to focus on flash and action, not emotion. We were saying goodbye to characters we loved and I wanted it to be more poignant. The film seemed disjointed and more about the special effects than the story. I mean, really, why did the director spend so much time in Bellatrix’s vault and in the room of requirement? Just to show off the special effects? That”s how it felt to me. Don’t get me wrong, there were parts I liked but overall, this one was not the best of the films. I’m sure a lot of people will disagree with me and remember, this is only my opinion so don’t crucify me in the comments. We can agree to disagree if need be. So, all in all, in my opinion, the final movie fell short of my expectations. Sad, really, as I hoped the series would go out with a bang, not a whimper.